Eighteen months ago, I was so proud of myself. I had lost 90 pounds and looked and felt fabulous. I was never going back. Except I did. I went about 25 pounds the other way. Twenty of them in the six months since we moved. And it feels miserable. Sure, there are reasons for it. Stress. Stress eating. Minimal exercise. Bronchitis. Bad weather for running. But, eventually, the reasons become excuses. And, once again, I’m done with excuses. Two weeks ago, I ran my second marathon. It was a miserable experience. I ran the first 14 miles and felt pretty good. But then it got hot. And I started to walk – which tightened up all my muscles, making it difficult to do anything other than walk. Even the walking was excruciating. But, I finished. It took me 29 minutes longer to finish than my last one did – perhaps because it was 77 degrees. Perhaps because I weighed 20 pounds more than I did last May. So, even though I am proud of myself for finishing the marathon, I am incredibly disappointed in myself. I made choices that led to a bad performance. I didn’t train well – no running for six weeks because of bronchitis, skipping long runs because of bad weather and the holidays. Eating when I knew I shouldn’t have. But I’m done with it. I’m done with my favorite clothes not fitting and feeling embarrassed by myself again. I’m finished with eating food that only makes me feel terrible about myself. And, perhaps most importantly, I am over not exercising properly and giving my body the opportunity to excel the way that I know it can. So, I’m holding myself accountable. At least thirty minutes a day for myself. Yoga, running, walking. Pushing myself toward the me I know I want to be and can be. Are you? This post will perhaps seem to be a complete contradiction to the one I just wrote… We arrived at school on Tuesday morning for an emergency faculty meeting. The time-stamp on the email was 12:48 a.m. It had to be bad news. And it was. Gayle Gay, a much beloved educator at Crawford, had passed away the night before. For five minutes, I’m not sure where I was – unable to fully process the news, I watched others around me. Heads buried in hands, tears streaming down faces, confusion on the faces of the teachers walking in late. Listening to the students as they received the news was even more difficult. Kids who seemed so tough, like nothing could break them, doubled over at their desks, their bodies racked with sobs. The others eerily silent – still processing, perhaps shocked by the reactions of their classmates. This was even more difficult than hearing the news for the first time. It was the second time some of them had confronted the death of someone close to them in four months. And for a little while, we were all just people hurting together. But I wish I’d known more. I wish I’d stopped to talk more, to ask personal questions, to get to know Gayle outside the hallway. She was one of my favorite people at work; she always put a smile on my face. And I never stopped to talk for long. Always somewhere to go, something to copy, someone to find. So perhaps my lesson is just to slow down. Take an extra 30 seconds. Or five minutes. In the end, won’t it have been worth it? I know… It’s part of the wedding vows, not the parenting vows. But I think it applies. After all, aren’t we supposed to love our children in sickness and in health? But surely there’s an exception to this, where maybe we don’t have to like them very much? Particularly if one parent is out of town and the remaining parent is also sick with the same virus and the child is just as sick and tired of you after three days together? Because if that’s the case, I’m right on track. As soon as I saw that Justin would be out of town for two full weeks in a row (home on the weekend between, thank God! ), I knew that we were destined for illness. It seems obvious, doesn’t it? So, it came as no surprise to get a text from Justin Tuesday afternoon that Robbie had a fever of 102.5 degrees. I headed out of school, knowing that I would be gone for Tuesday and Wednesday. I never imagined Thursday, too. Nor did I imagine that I would have the same virus, knocking me out for a day and a half as well. Robbie and I only left the bedroom to get food yesterday. And, since neither of us was eating, that was rare. It was constant together time. We went to sleep last night planning on going to school today. We were both ready, each of us over our respective virus. Then Robbie’s fever shot up to 101 this morning and I was still horribly nauseous. We headed back to the doctor, since Robbie complained about his chest and throat hurting. Another nose swab and throat culture gave us no definitive answers; we just had different versions of the same virus. Home we came, prepared for an afternoon of movies and cuddling. At least that’s what I was prepared for. Robbie was prepared for disaster. We made it through The Cat in the Hat, which Robbie watched in his chair while I napped fitfully on the couch. Then, determined to be somewhat productive, I went to the bedroom to put away the laundry my sister had generously folded yesterday when she came to bathe Robbie and got sucked into our laundry pile. It was very quiet, so I asked Robbie what he was doing. His response left me struggling for words. And he had. Into four pieces. He had also spilled the entire box of oyster crackers onto the floor and done some sort of dance on them. It was all I could do to maintain my composure. OK. I didn’t maintain my composure. I yelled. I cried. Robbie cried. But my glasses were still broken. The night continued to improve… Robbie dropped an entire pizza face-down on the floor – I have no idea how that happened. And, as we finally cuddled up in bed (we ARE going to school tomorrow), the dog jumped up with us. And puked all over my newly cleaned duvet cover. And did I mention that Justin is out of town until tomorrow? Stunned, there wasn’t much more I could say. Even Justin, who was following my comment with, “Well, I helped make you, Rob. You’re half mine,” was speechless. Because Robbie’s right. God did make him. And I’m not sure how or why, but I sure am glad that when God made Robbie, he entrusted us to be his parents. There were no words. I squeezed my child a little tighter and kissed the top of his head as tears welled up in my eyes. There is nothing quite like the blindless devotion of a child to God to bring everything into perspective. I know he hears about God in pre-school and Sunday school. And I know he goes to chapel once a week and insists on being the one to say prayers at every meal. But to see him pray when he doesn’t know anyone is watching or listening? It is a beautiful reassurance to me that there is a God. One of my favorite episodes of The Cosby Show was when Rudy’s goldfish dies. The entire family dresses up for the funeral, and, as they are all gathered solemnly around the toilet, Rudy asks if she can go watch TV instead of attending the funeral she insisted they have for the fish. Today we had our own version of this episode. 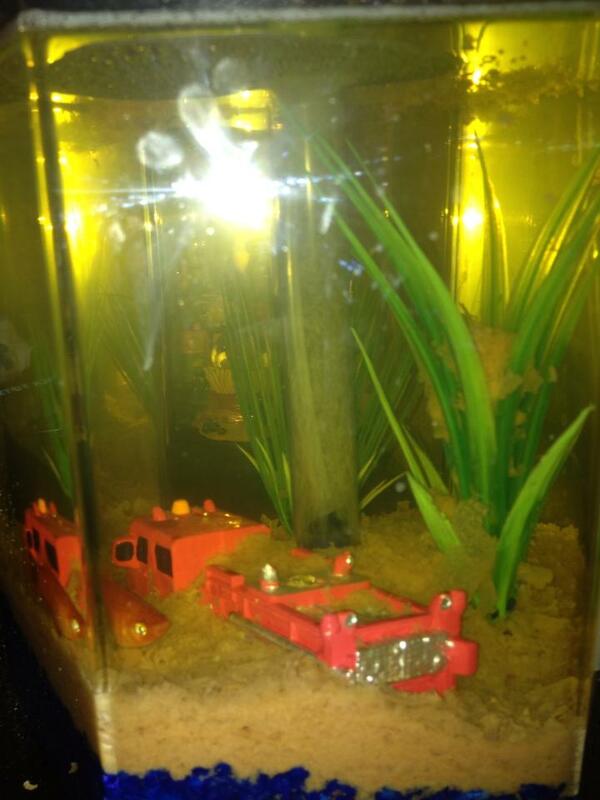 The events started last night when I did a double-take as I passed the fish tank if Robbie’s room. It took a few minutes for me to realize what had happened. But, after my eyes recovered from the bright orange of the water, I realized what had happened. Robbie had fed his fish. The entire canister. Every last flake. The tank looked like it had been hit by an epic snow storm. Even the firetruck was up to its windshield in flakes. Concerned about the welfare of the fish, I took the tank downstairs with me after Robbie went to bed. The fish went into a glass on the counter with as little of the sludge as I could manage. I painstakingly sorted through the gravel and decomposing fish flakes. Unfortunately, we didn’t have any water treatment, so the fish had to spend the night in the glass. As soon as we got home this afternoon, Robbie raced to the kitchen to check on his fish. He was no more. The sludge had claimed him. So, we opted for a burial at sea. Robbie and I headed to the bathroom, glass and fish in hand. Robbie helped me pour the glass into the toilet. He said a few words about what a good fish he had been and then looked to me. I asked Robbie if he wanted to say a quick prayer, and he nodded his head and folded his hands. “God is great; God is…” Then it occurred to him that we weren’t eating. He looked up a little confused and unsure of what to do. We managed to finish the prayer together, and then it was time to flush. I once read an article in a magazine that claimed women were more likely to ask their children to do chores around the house than their husbands. And it’s probably true. After all, what could our husbands possibly know about keeping a house clean and running? Probably best to let them do their “husband” thing while we become more and more frustrated at their lack of interest as we load the dishwasher, start another load of laundry, step on toys left all over the living room floor, and get dinner on the table. Right? Turns out, no. Not at all. But, in most cases, it’s really not the fault of our husbands. We don’t want to turn the control over – or, at least, I don’t. I like to know that the dishes are all in their right places and the laundry is sorted into three laundry baskets to make putting it away easier (or, to be totally honest, grabbing clothes in the morning because we didn’t put them away). I don’t know why I do; I just do. Except I don’t anymore. Slowly, over the past eighteen months, I’ve lost control of our house. Although he travels for work quite a bit, Justin actually runs most of our house now. It’s a bizarre sensation, asking Justin where certain dishes are or finding the bed made almost every day – and not by me minutes before climbing into it again. It really hit home last Sunday when, as I finished breakfast, Justin undecorated our tree and packed up the ornaments. Then, he put all the rest of the Christmas decorations away, taking care to pack them all in the ginormous “Christmas box” he’s had since he was little. I’ll admit; this was hard for me. I have certain boxes for my ornaments, certain boxes for Robbie’s. But this year, they were all jumbled in together with Justin’s childhood ornaments. In random boxes. And our Christmas decorations weren’t put into the plastic bins I painstakingly labeled “CHRISTMAS” with green Sharpie years ago. It took every ounce of willpower in me to not correct the job Justin was doing. And you know what? It felt pretty good, especially because within an hour, all the decorations were put away and in the basement. And I didn’t have to do any of it. I’ve also figured this will make decorating even more fun next year because I have no idea what I’ll be unpacking. A beautiful thing happened when I didn’t correct the job Justin was doing; he continued doing other things around the house. And let’s be clear – there was nothing to correct, which is the key here. Just because Justin’s way isn’t mine doesn’t make it wrong. Hard to believe, I know. Yesterday, for instance, I got a text while I was at school. It simply said, “What can I do to help you today?” Funny thing: I did need help. The rabbit in my classroom desperately needed a new water bottle. And so Justin stopped (at two stores) to pick one up for me. Today, he stopped to buy fabric we (read, I) were supposed to pick up over a month ago for a chair I want reupholstered. And while he was in the neighborhood? He stopped to buy new shoes for Robbie. Tonight, while I was putting Robbie to bed, Justin cleaned the kitchen. All of it. Later, when he could have been watching TV or puttering around on his iPad, Justin clipped coupons while I wrote a grocery list. Did I mention that I don’t go to the grocery anymore? Don’t get me wrong; I still do a lot around the house (especially when Justin is traveling). However, as Justin would be more than happy to tell you, when he is in town, he does a lot more around the house than I do. So, give the husband a little more positive reinforcement when he makes the move to help out. For goodness sake, don’t correct him. In the scheme of things, he’s not doing anything wrong; it’s just different. And, when you don’t have to do it and can spend a little more time having fun together, different is a wonderful thing. Remember those long, luxurious hours spend soaking in a hot bubble bath? Good book in hand? Maybe a little music playing? Yeah. Me, either. After a long run tonight, there was nothing my body wanted more than to soak in a near-scalding bathtub, letting my mind unwind after a long first day back at school. And then the bathroom door came flying open. It was all I could do to not slide under the water. I knew it wasn’t Barkley; the intruder had used the doorknob to enter. It could only be one person, since Justin was watching the Sugar Bowl. It was he-who-should-have-been-sleeping-but-wasn’t. Robert Gaetano Manna, himself. Fortunately, between the incredible bath bomb from my sister and the powerful tub jets, I was completely covered with bubbles. “I need to take a bath, too, Mom. I’m dirty,” Robbie declared as he started to take off his shirt. “Wait!’ I screamed – we’ve reached the age where this whole situation was about to get extremely awkward. “You’re not dirty! You don’t need to take a bath! Go back to bed!” And, I’ll admit, my voice got a little more high-pitched with each sentence, envisioning all of the therapy sessions that were sure to occur somewhere down the road when Robbie remembered taking a bath with his mother. But then I remembered what I wrote yesterday – about cherishing every moment – and sent Robbie to go get Justin. Ten minutes later, Robbie and I were both in our bathing suits, enjoying bubbles that covered Robbie when he sat in the tub. We pretended Robbie was a snowman – a melting one, as he watched the bubbles fall from his shoulders down his body and back into the water. Robbie slipped all over the place, pretending to be a merman (after a brief lesson in gender, as he was declaring himself a mermaid initially). All of a sudden it happened – the moment that makes giving up a moment of tranquility completely worthwhile. Robbie grabbed my face in both of his hands, stared into my eyes, and said, “Mom, we’re having fun together, aren’t we?” Before I could respond, before I could even fully hold onto the moment, it – and Robbie – had slipped away. I sure am glad I was paying attention. As so many of you know, Justin and I had a difficult time adjusting to Robbie’s sensory processing difficulties. It seemed like we were never going to have a “normal” child. We were never going to make it through a meal at a restaurant or a church service. We would always have to leave playgrounds because Robbie acted aggressively toward other children. Bedtime would involve epic meltdowns for all eternity. And Robbie would spend the rest of his life running around like his pants were on fire. And so, desperate for some sort of reprieve, we started Robbie in occupational therapy. I was skeptical. How well could this really work? Robbie was going to go once a week. We were supposed to brush him and perform joint compressions every two hours. And this was really going to change our lives? Brushing was going to make Robbie calmer? No way. Not even possible. But we did it anyway. Justin and I saw some changes but then, as soon as we thought we were good, there would be a setback. A page-long letter from his pre-school teacher about three trips to the school office in one day for kicking kids, climbing cabinets, and leaping from cot to cot during nap time. Or the phone call asking us to come pick him up because he had slapped a child. Which is how we headed into Christmas vacation. But, all of a sudden, something changed. I’m not sure if we were more consistent about brushing and incorporating a sensory diet into our day or if things just started to click with Robbie, but the past twelve days have been wonderful. Sure, we’ve had our moments. Like maybe when I told Robbie he couldn’t get a gun as a prize at Gattitown and he threw a fit, so we left without a prize at all (one of my strongest parenting moments). On our way out, he punched me in the face twice. But, this gave us the opportunity to be firm in punishing him, and I think it’s the first time he’s realized that his actions have implications. This break, we survived (barely) a Christmas Eve church service. Robbie went shopping with me and held my hand the entire time – not running around and making the entire experience a nightmare. He wants hugs and kisses and snuggling. He talks about how happy he is and how much he loves us – without prompting. And he seems so much freer to just be himself. Which I think is the most any parent can ask for. All last year, Robbie waited for snow. It makes sense, right? We lived in Boston. There should have been lots of snow; the year before we had endured over 100 inches of the white stuff. But not last year – there was never enough to even make a good snowball. As soon as Thanksgiving was over this year, Robbie started asking for snow again. In his mind, it made sense. December means Christmas and Christmas means snow. Finally, after waiting almost two years for a decent snow, Robbie’s hopes and dreams came true. It wasn’t much – maybe three inches – but it was more than enough to make a certain three-year-old happy. As soon as I walked through the door from the gym, Robbie ran to me, thrilled to tell me that it had snowed. We raced through the house, collecting one Spider-Man snow boot from my closet and another from his, gathering gloves and winter coats. And a carrot. Then we were off, racing outside to see if the snow was right for snowmen. It was perfect. We rolled huge snowballs, stacking them on top of each other to create a snowman. Robbie proudly handed me the carrot he had remembered to bring for the snowman’s nose and then we collected rocks for the eyes, mouth, and buttons. We stood back to examine our handiwork, and Robbie declared that we needed to make more snowmen. He ran back to the house two more times to get carrots and helped me find just the right rocks.